Late in my final semester of college I got accepted to the Eddie Adams Workshop (Barnstorm IX, in 1996). It was easily the highlight of my senior year. I was just wrapping up four years at Kansas State University, which had nowhere near the amount of photojournalism students as, say, University of Missouri or Western Kentucky University did. So while K-State had a strong tradition of photography in its Student Publications department, I was relatively isolated from the larger world of photojournalism. So going to the workshop was a real eye-opener for me. Just being around 99 other photographers who were roughly close to my age and experience level was an invaluable experience. 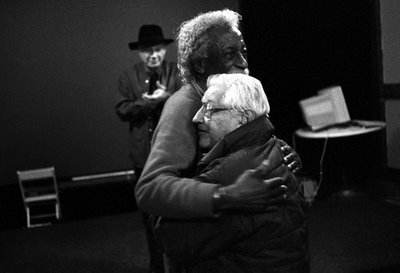 Thirteen years later, however, it's not so much my fellow workshop attendees that I think about as much as being able to meet icons like Gordon Parks, Carl Mydans and of course Mr. Adams himself (and many others). I've been digging through my college negs this past week trying to find an image to contribute to the 100th Anniversary edition of K-State's yearbook, the Royal Purple. But I've come across a ton of other pics and this one of the three aforementioned photographers is one I wanted to share. Wow, wonderful picture! Thanks for sharing.